The package I’ve been waiting for almost a week. The most expensive piece of clothing I ever bought in my entire life! 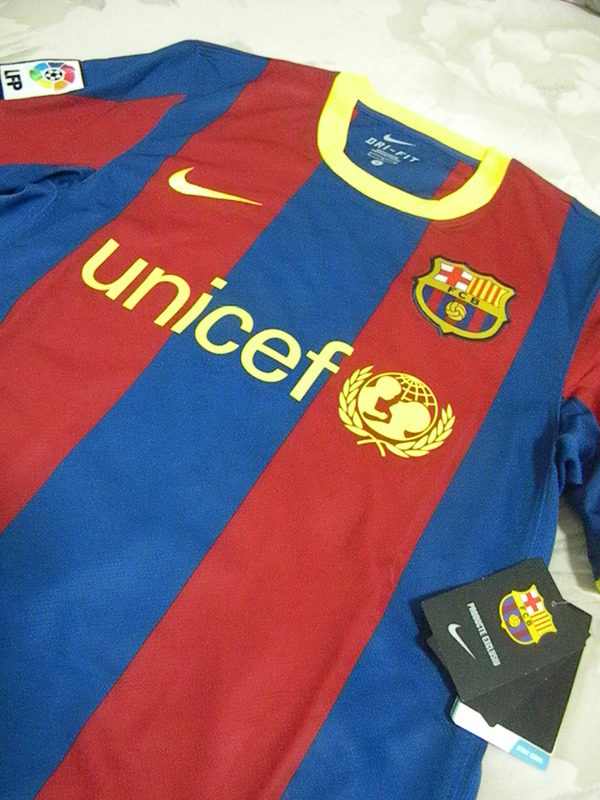 My very own AUTHENTIC FC BARCELONA HOME SHIRT 2010/2011! I started to become a fan of FC Barcelona, a football club from Catalonia, Spain, about 8 months ago, right after the 2010 World Cup. I have known Barcelona for a long time as a leading football club in Spanish La Liga, from the time of Ronaldo and Thierry Henry. I also knew the buzz about the new Maradona, Lionel Messi, who was the rising star of the club. I even support them on the 2010 Champions League Semi Final against Inter Milan, just because I hate Inter (Sorry Inter Milan supporters, but I am an AC Milan fan. ;p). But I loooove the Spanish National Team, and I support them whole-heartedly on the 2010 World Cup. The day that they won the World Cup, I went about without sleep for 23 hours, just because of the euphoria. So, naturally, because more than half of the Spanish National Team starters belongs to FC Barcelona, I started to rigorously watch Barcelona on the Spanish League. And OMG, they completely blew me away! They are the showcase of talents, meets team spirit, meets harmony, meets honor, meets history. They play beautiful attacking football, with accurate short passing from feet-to-feet that gets you shouting ‘Ooh’, ‘Ahh’ and ‘Wow!’. Recently, they are considered the Best Club in the World that displays Modern Total Football. And of course, you can’t love Barcelona without being in love with their leading striker, Lionel Messi. Currently voted best football player in the world for two years in a row, Messi is the epitome of football genius. I’ve never seen a club this good and a player (Messi) this great in my 15 years of loving football! I can’t get enough of them. I watched every game, every replay, every updates and news of them. There’s not a day without me going through their websites or facebook page for new updates. I joined their fan club. I have their wallpaper all over my gadgets (Blackberry, laptop, etc). So basically, I AM Obsessed!! I don’t want to over analyze my behavior. I got this way every now and then when I encountered something that I considered GREAT. I am very enthusiastic about the things I love. They say that people love to be associated with Great things because it allows them to feel that they are a part of Greatness. I do feel that by being a Barca Fan, I am a part of history in the making. FC Barcelona is like what its slogan says: “More than a Club”. It has become a symbol of Catalan culture because it is the sports club that most represents the country and is also one of its greatest ambassadors. It has done numerous humanitarian efforts in its strategy to take a step further and become “more than a club around the world” as well. Not many clubs has this vision of wanting to be More to the world. I admire Barca so much for that. Having said all of the above, to me the value of the shirt is a lot. More than the cost of the fabrics, the stitching, the printing, combine with the labor, transport, delivery, etc. The sentimental value of it can not be named a price. Because I am holding a piece of history that I will value more with time. 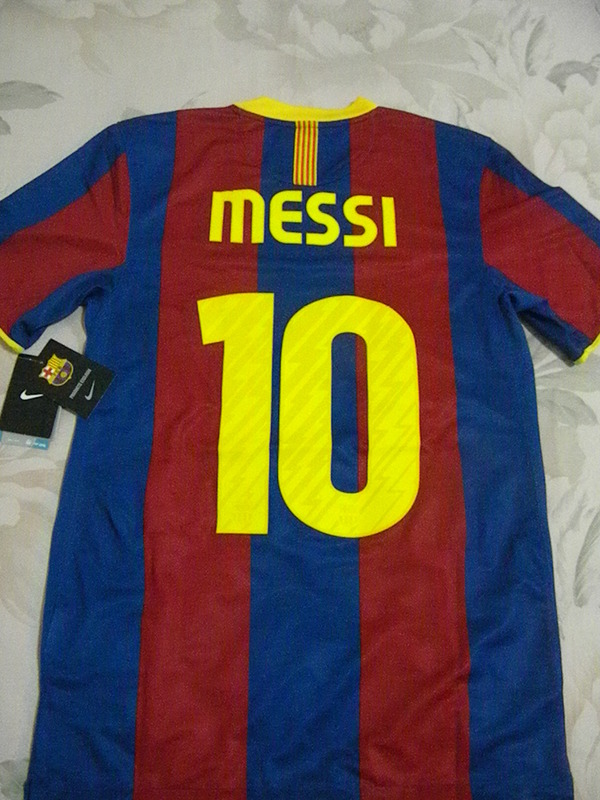 I will wear My Authentic FB Barcelona Shirt with pride!